Rather than eating at the the ridiculous number of buffets and overpriced restaurants in Vegas I wanted to spend as many meals as possible off of the strip, eating things that I couldn't get anywhere else. Sunday morning we rented a car to get to breakfast. 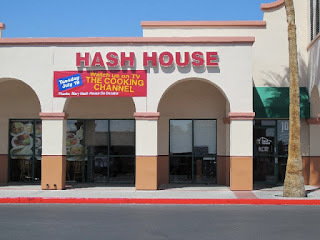 We drove to Mary's Hash House which was about ten minutes west of the strip. It's a quaint little place, but what struck me when I walked in was the window on the back wall that allowed you to see into the kitchen. I found out that the owner herself was back their preparing our meals. All the recipes were her own and everything was made fresh and from scratch. This place was special. 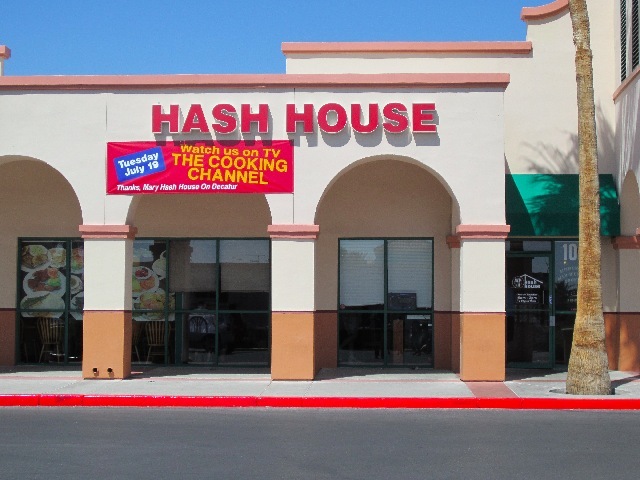 The restaurant is known for its hashes and that's what the majority of us ordered. I went with the traditional corn beef hash with grits and fruit on the side. I'm no hash expert but this was terrific. Everything was cooked well and it was seasoned perfectly. There really is no criticism I can offer. It was really good. 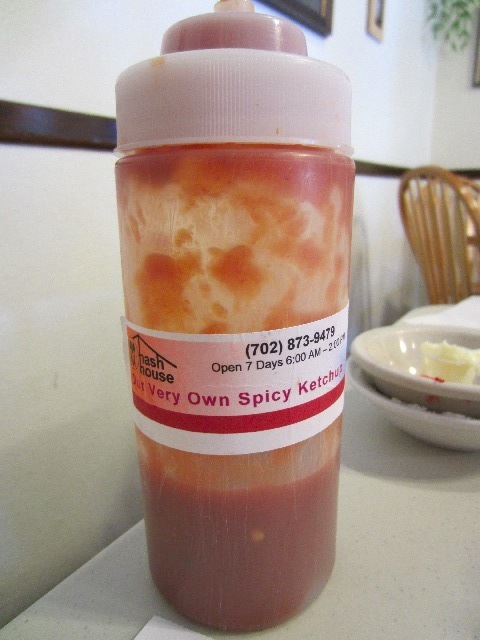 What really took it to the next level though, was the addition of their homemade spicy ketchup. Just awesome! Everyone else agreed except for those that didn't order hashes and subsequently wished they had :). For lunch that day we ended up at Capriotti's Sandwich Shop, which is a relatively small west coast franchise (there are some eastern ones as well). Let me start by saying that I'm probably never going to be able to happily eat at Mr. Sub, Subway, or Quiznos again. If sandwich making were an art these people are da Vinci. 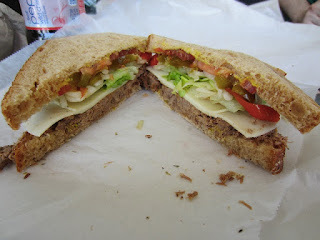 Not only is provolone standard on EVERY sandwich, they actually spice, cook and shred their own roast beef and turkey. 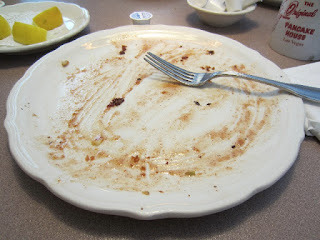 It was all really fresh and flavourful and not at all dry like some roast beef sandwiches can be. However, the sweet pepper jelly that topped my sandwich was what took it over the edge. Tangy, sweet, and insanely delicious. Dinner that day was a bit difficult. We needed to drop my friend off at the airport later that evening so we were working on a bit of a timetable; especially since I managed to waste a lot of time singing and dancing at the M&M's store (I swear I saw an oompa loompa). After deciding against Serendipity 3 (high prices, despite the promised portions) and The Buffet at the Bellagio (stupid long line) we ended up at Tacos El Gordo on the north end of the strip near our hotel. The reviews were scary good, and at the end of the night we were much happier that we ended up here. This is the kind of place you could never hope to find in Ontario. The chefs were shouting Spanish back and forth while huge amounts of meat were dumped on the grill, cooked then chopped. Not to mention the speed at which handmade corn tortillas were being pressed in front of you before being tossed on the flat top. 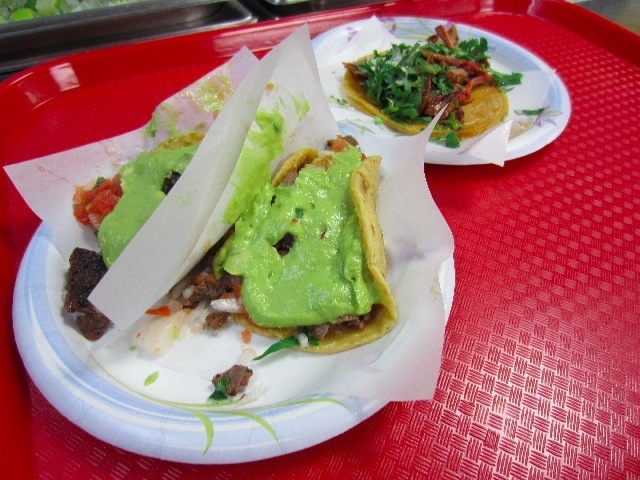 And once it's your turn to order, your tacos are prepared faster than lightening. 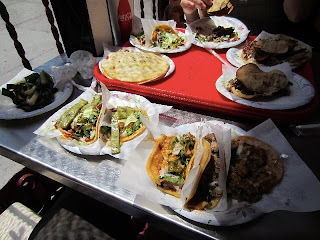 It was organized chaos, amazing to watch and probably the most authentic Mexican street food you could hope for. It all tasted amazing. So fresh and flavourful and at roughly two dollars a taco, you can try nearly everything on the menu. Oh and let me tell you about the fries. 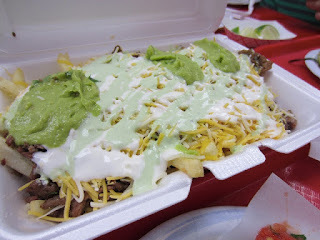 We ordered a small carne asada fries and they were enormous! And tasted fantastic. How can you not love fries topped with cheese, sour cream, guacamole and STEAK! And for some reason the fries and the tacos featured the best guacamole I've ever tasted. There was just something much lighter and less rich about it. 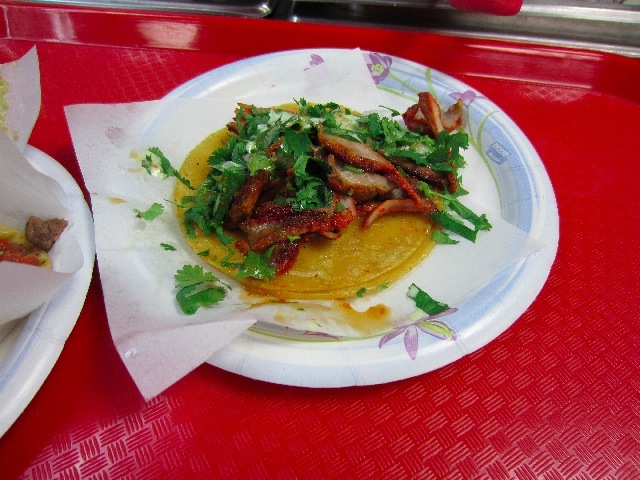 It complimented the flavours of the taco instead of overpowering them; which was great because there were a lot of big flavours going on for such simple preparations. Each taco slightly different depending on the meat you chose and how it was dressed. 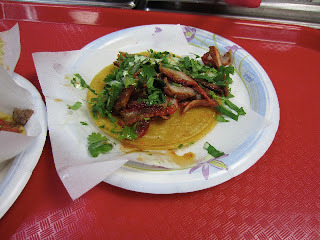 I even tried pork stomach, which had a texture similar to calamari. It was really quite good. 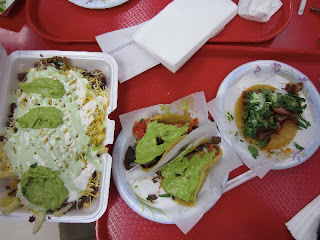 My favourite was the standard steak tacos but really everything was amazing. Oh yeah, we went back for lunch the next day and ordered even more. 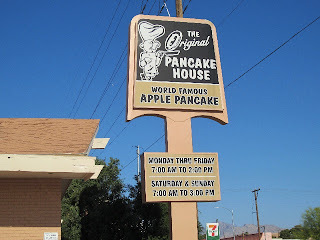 However, before lunch we had breakfast at The Original Pancake House known for their German pancakes and its apple pancake creation. It's a bit of a larger franchise but after seeing pictures and reading some reviews, I couldn't resist. 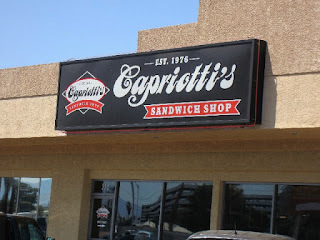 One thing to get used to in Vegas is that nothing opens early, so we arrived at 7AM just as the restaurant was opening. We were greeted by our very nice waiter, and I wasted no time asking for his recommendation. Of course he told us about the German pancake and the apple pancake but suggested that if we order the apple pancake we should also order a side of bacon to help break up the pancake's sweetness. We took his advice. 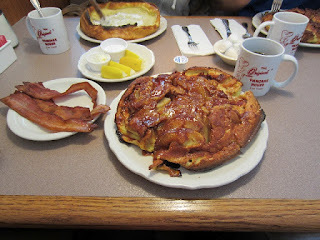 My brother and I ordered the apple pancake and his girlfriend the German pancake. 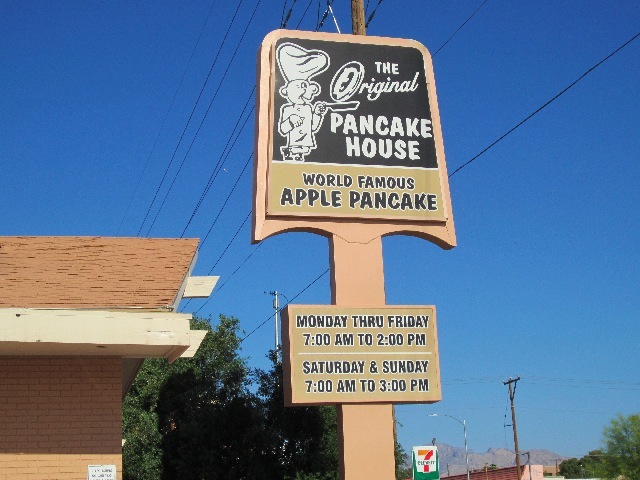 Then something happened that has never happened before; the waiter tried to warn us against two apple pancakes, recommending that we order one german pancake and one apple because of their sizes. My brother and I looked at each other and, with a dumb-jock like attitude, took it as a challenge. We ordered two and this is what came to our table. Honestly it was insane. It's the closest you could ever come to eating a whole cake for breakfast. 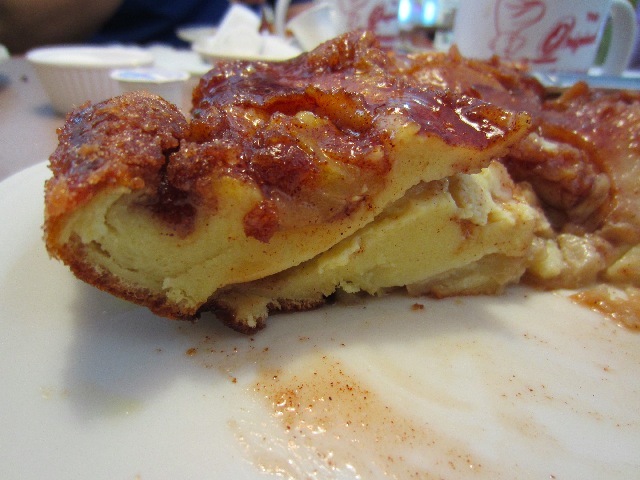 There must have been about four apples in it, held together by an egg cake. It was pretty good. 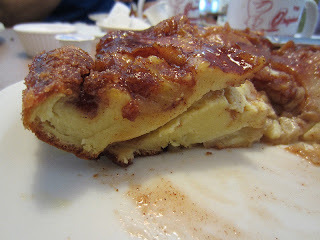 The "pancake" was its best at the crispy edges and top, especially where the cinnamon sugar topping had caramelized, breaking up the otherwise soft texture. It was quite sweet but that bite of bacon here and there definitely helped to keep it at bay. And the bacon was incredible, some of the best I've ever had; thick, not too chewy or crisp with a nice and smokey not too salty flavour. Unfortunately one of the draw backs of this "pancake" is that if the apples aren't distributed evenly you can be left with a fortress of egg-cake. This happened to my brother. It was too much for him (he's not an egg person) and he had to give up. I didn't have the same problem. And with the finish line in sight, I went for it. The german pancake was good (I had only a bite). It shared a lot in common with a Portuguese egg tart (though a hundred times larger). 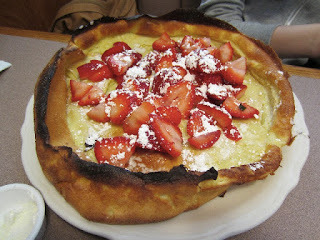 And when slathered with butter, filled with strawberries, drizzled with lemon juice and covered with powdered sugar, offered a pretty unique flavour that wasn't too sweet, not too eggy and didn't taste too heavy. 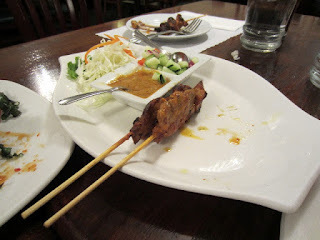 For dinner that night we had our sights set on Lotus of Siam Thai Restaurant. 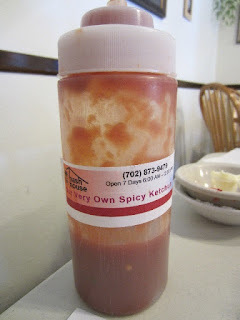 Apparently it is not only considered the best Thai restaurant in Nevada, but also one of the best in the country (check out their awards). And they acted like it. Dinner only by reservation, no walk-ins (or at least they don't like it); and if you're more than five minutes late for your reservation they give it away. Needless to say we left early :). This truly was a highlight meal, everything was pretty amazing. We started with fried dumplings, spicy chicken wings, pork satay, as well as mee krob (crispy noodle mixed with sweet and sour sauce, chicken and shrimp). 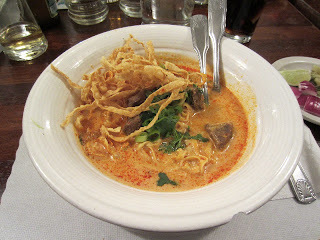 Everything was really good, but mee krob was something we'd never seen before and it was outstanding. 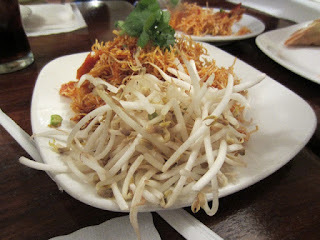 Crispy and sweet noodles that when topped with bean sprouts, perfectly balanced the sweetness; add some flawlessly cooked chicken and shrimp and you have one of the most memorable dishes of my trip. I would have happily eaten it for dessert and my brother probably won't rest until he finds a restaurant that offers it near home. 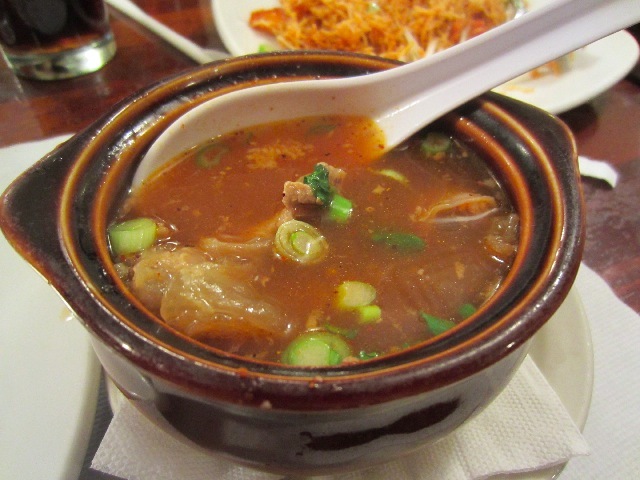 For personal appetizers, myself and the bride ordered a bowl of En Tuan (Spicy and sour soup with beef tendon, bean sprouts and beef). I've never had beef tendon before, the texture was a bit unusual but the broth had a deep and rich beef flavour with just enough spice to give you the sniffles but not enough to destroy your palate. It was among the best hot and sour soups I've ever had. For my main course I once again asked the waiter to recommend what I should order. From his suggestions I chose the Khao Soi (egg noodle served in curry sauce and coconut cream with beef, garnished with sliced red onion, lime and pickled vegetables). It was one of the most balanced plates (bowls) of food I've ever eaten. Soft egg noodles paired with crispy fried noodles in a broth that was creamy but not too rich, with beef that couldn't have been anymore tender. 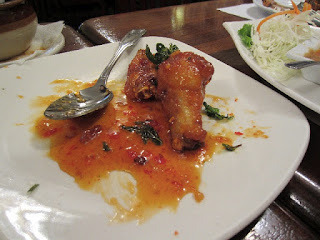 The coconut cream helped to cut the curry's spiciness but the cream's richness was broken up by the pickled vegetables and the lime juice, which are added just before eating. I literally had to stop myself from licking the bowl. It was that good. I must have mentioned how much I loved the broth about ten times during dinner. Despite all that great food, the dessert menu was a bit lacking; so it was a good thing we noticed a pie place on our way to the restaurant: Marie Callendar's Pies. Perhaps this franchise is well known on the west coast, but I had never heard of it. 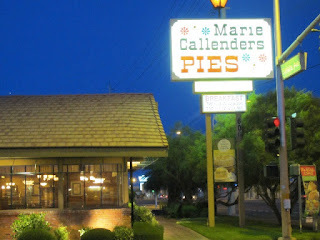 It was quiet and quaint, with a terribly friendly wait staff. We each ordered a different slice of pie. My brother, coconut cream; his girlfriend a type of chocolate cream; and the groom a chocolate satin pie. Upon walking in I had planned for pecan pie, but on staff recommendations I ordered the Double Cream Blueberry and I'm happy I did. It wasn't something I had ever tasted before. 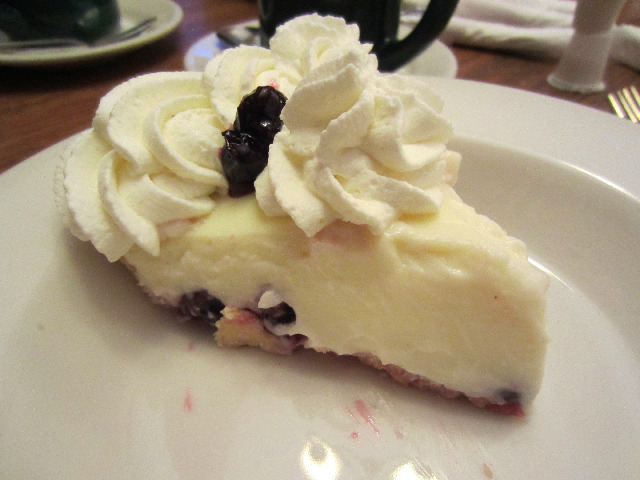 A thick layer of cream topped a thin sweet layer of blueberry preserve. 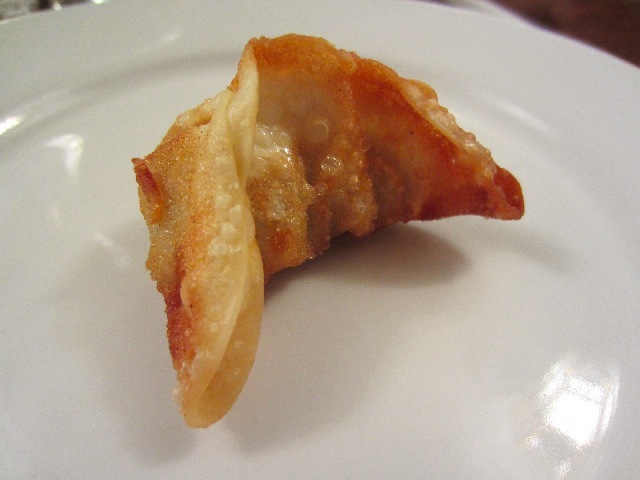 It was tangy and lightly sweet with a subtle cream cheese flavour but none of the heaviness and not nearly as rich. Honestly, it tasted much lighter than it should have (or was :)). I suspected that it was made with sour cream, which the waitstaff confirmed. It was so good that the first thing I did when I got back to my hotel room was look up a recipe. So that's my food trip through Las Vegas. We went to a lot of nice places with great people and terrific food. They weren't all one of a kind, but all offered unique food experiences that I could never find at home. I'm not sure I'd ever go back to Vegas without a good reason but I'm definitely not against it. Besides, I didn't get to visit all the restaurants that I wanted :). "Where ya goin' now? Back to the future?" Great food photos in this post! I'm a cook, not a restaurant reviewer (I rarely eat out) so I'm always very impressed when people take great photos when the lighting is inconsistent and it's hard to find a good time during a social meal to get a shot. I love provolone cheese and recently had an internet conversation with some foodies to find that it's a controversial ingredient. It's one of those foods I just assumed everyone liked! That blueberry pie looks beautiful and sounds so unusual! But holy portion size, Batman! The pancake house offerings look SO beautiful, but I would have had to have had a poached egg and just watched everyone else eat. I'd love to see if you could recreate either of them, sized to more human proportions! And a recipe for the pie as well! Thanks for the compliment on the photos. I suppose they did come out well for the most part. I probably attribute this to two things, I had no issue pulling out an actual camera, nor did I have a problem taking 20 pictures per food item :). 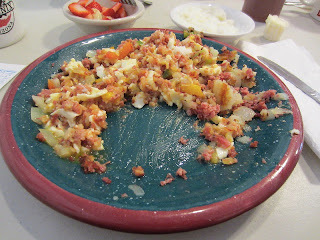 You wouldn't "have" to have poached eggs, you should always eat what you "really" want on vacation (within reason). 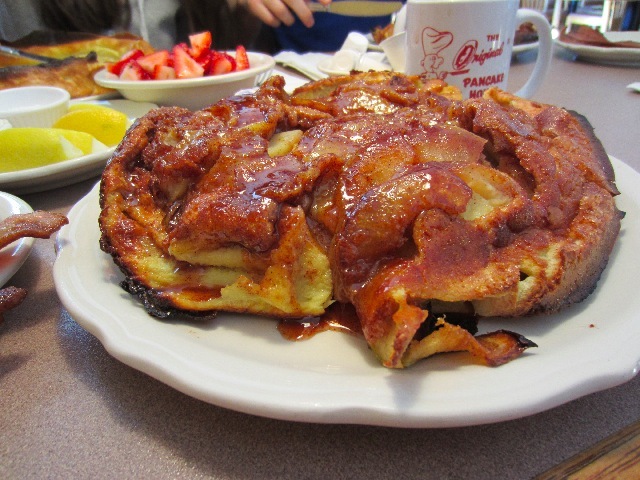 Though I have to say, it's probably better if you share that apple pancake :). And I'm currently thinking about how to recreate the pancake with an Adam twist :). My friends have raved about lotus of siam, glad you got to go and that it met your expectations.